We, the General Joe Wheeler Camp, wanted to take time and suggest some reading material. We believe in order to teach and present the true history of our ancestors we must first read and gain knowledge. The history books in our schools do not teach the true history along with expressing the views of the Southen people along with what really happened during the War Between The States. These are some of our favorites that are very informative. We will continue to update the list as books are brought before the camp so please continue to check back. Through extensive research and meticulous documentation, DiLorenzo portrays the sixteenth president as a man who devoted his political career to revolutionizing the American form of government from one that was very limited in scope and highly decentralized—as the Founding Fathers intended—to a highly centralized, activist state. Standing in his way, however, was the South, with its independent states, its resistance to the national government, and its reliance on unfettered free trade. To accomplish his goals, Lincoln subverted the Constitution, trampled states' rights, and launched a devastating Civil War, whose wounds haunt us still. According to this provacative book, 600,000 American soldiers did not die for the honorable cause of ending slavery but for the dubious agenda of sacrificing the independence of the states to the supremacy of the federal government, which has been tightening its vise grip on our republic to this very day. 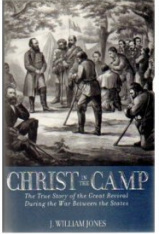 This book leads you through the Great Spiritual Revival in the Confederate Army during the War Between the States. It looks into the lives of the army chaplains, soldiers, and generals during their spiritual journey to know Christ. This is the untold story of the Union's "hard war" against the people of the Confederacy. Styled the "Black Flag" campaign, it was agreed to by Lincoln in a council with his generals in 1864. Cisco reveals the shelling and burning of cities, systematic destruction of entire districts, mass arrests, forced expulsions, wholesale plundering of personal property, and even murder of civilians. Carefully researched largely from primary sources, this examination also gives full attention to the suffering of Black victims of Federal brutality. "When in the Course of human events, it becomes necessary for one people to dissolve the political bonds which have connected them with one another, and to assume among the Powers of the earth, the separate and equal station to which the Laws of Nature and of Nature's God entitle them, a decent respect of the opinions of mankind requires that they should declare the causes which impel them to the separation." With these words, thirteen of the British colonies in North America unanimously declared independence from British rule. Eighty-five years later, adhering to principles articulated by their revolutionary forebears, the 11 Confederate States of America seceded from the United States, plunging the country into the bloodiest war of its history. Until the publication of this highly original book, most attempts to explain the origins of the American Civil War relied heavily on regional sympathies and mythology—that the South abandoned the Union to maintain slavery while President Lincoln's primary goal was to preserve the nation. Prominent scholar Charles Adams challenges this traditional wisdom. Using primary documents from both foreign and domestic observers, Adams makes a powerful and convincing case that the Southern states were legitimately exercising their political rights as expressed in the Declaration of Independence. Although conventional histories have taught generations of Americans that this was a war fought for lofty moral principles, Adams' eloquent history transcends simple Southern partisanship to show how the Civil War was primarily a battle over competing commercial interests, opposing interpretations of constitutional rights, and what English novelist Charles Dickens described as "a fiscal quarrel." Much of War Between the States history is untrue because like most history, it is written by the victor. The story we hear is that hundreds of thousands of Southern men went to war over an issue that only affected six percent of the population. Read this book and learn the truth: there was no shining Northern force fighting a moral battle for the sake of ending slavery; there was no oppressive Southern force fighting to preserve it; and after the South declared its independence, the Union ruthlessly invaded, leaving Southerners no choice but to defend themselves. Along the way, he reveals a huge number of little-known truths, including why Robert E. Lee had a higher regard for African Americans than Lincoln did; how, if there had been no Civil War, the South would have abolished slavery peaceably (as every other country in the Western Hemisphere did in the nineteenth century); and how the Confederate States of America might have helped the Allies win World War I sooner.